With ribbon weaving you can make a variety of items, from holiday ornaments to accessories and even clothes. You can finger-weave ribbon into colorful braids to accessorize a garland or wear as a headband. Weave ribbon into covers for scrapbooks. Cover Styrofoam shapes with woven ribbon to make baubles for your Christmas tree. Weave ribbons into purses and spectacle cases. You can weave ribbon alone or use other materials with it. It's easy to weave ribbons into a variety of decorative and eye-catching braids. By using two contrasting colors, such as red and white, you can make candy-striped braids, diamond patterned braids and zigzag braids. Use these to adorn gifts, holiday wreaths and homecoming mums. Using sturdy grosgrain ribbon, you can also weave braided ribbon straps for purses or tote bags. Decorate a scrapbook or diary with woven ribbon. Take a piece of thin cardstock and apply a narrow stripe of adhesive along the outside edges. Lay strips of ribbon in one color from corner to corner till the whole card is covered. Weave strips of ribbon or lace in your second color in and out of the first layer of ribbon. Finish by machine stitching the piece all over. Cut sections to decorate your book covers. Weave decorative fish shapes out of ribbon. Weave two ribbons of the same width in a square pattern, leaving the ends of four ribbons free and extended to form the fins and tail. Add beads or googly eyes to complete the look. You can turn this fish into a pin or barrette by hot-gluing it to a brooch back or bobby pin. Punched vinyl is the strip of material left over when round shapes have been punched out of it. A similar material is sequin waste, also known as punchinella. This is the long strip of material left over from sequin manufacture. 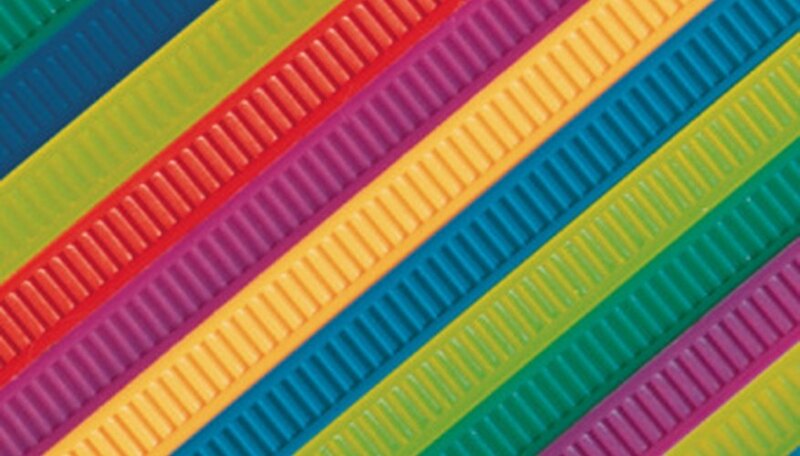 You can use punched vinyl or punchinella for ribbon weaving projects. Simply weave ribbon through the holes in the material. You can use this technique to make purses, wallets or a case for your sunglasses. Take a ball of Styrofoam or similar material that's the right size for your ornament. Create a woven pattern with inch-long scraps of ribbon glued in rows around the ball. Alternatively, pin strips of narrow ribbon running from the top to the bottom to the top of the ball, then weave ribbon in a contrasting color in between the vertical ribbon stripes. Create sheets of woven ribbon and use the resulting fabric for bags and accessories. Pin vertical lengths of ribbon to a thin liner fabric. Weave horizontal lengths of ribbon in between them. When your piece is done, machine stitch it all over to prevent the ribbons from shifting. You can now sew this fabric into a tote bag, use it as panels for a waistcoat or incorporate it into a quilt or wall hanging. How Do I Make a Wire Mesh Ribbon Christmas Wreath?